When it comes to life, we all want to be happy. And we deserve to be. Because we only get one life. So it’s definitely important to think about the things that you can do to make sure that you always live a happy life. First of all, you should definitely aim to be positive. Because positivity can really change your life. If you aim to see the good things in life, then you will see them. When you aim to banish negativity from your life, and you focus on the things you’re grateful for instead, it’s impossible to be sad! The next thing that you need to do, is to be a lot more intentional with your life and your time. Your mindset too. If you want to be happy, then you have to actively seek happiness. Make sure that everything in your life serves your happiness, and walk away from anything that doesn’t! And finally, you may find that it helps you to find happiness in your life, is there’s something that you can be passionate about. When we have interests in life, and we pursue them, we’re feeding our happiness. To do this, you need to know what serves you as a person. 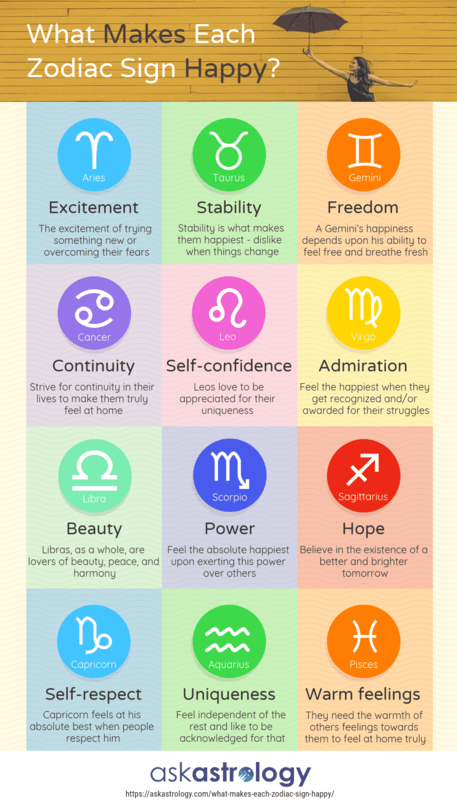 One option here is to take a look at your personality and start sign, as seen in the infographic below, to know what you need from life. But you can also turn to your personal interests too.